We wrote this page when we had finished 15 Categories and in some images you will still see 15 categories. Now we have 20 of them, but the story remains the same, of course. We have also created small BMP files, so you will see the same Icons on your GPS Navigator as in Google Earth. There are two formats. One series with 22x22 pixel BMP files for all systems, except Sygic, which needs 27x27 pixel BMPs. Click on the right link for your device/program and download the file to your desktop, or where-ever you prefer. Now you will have to unzip the file to obtain the BMP files. We will explain below how to get them into your GPS Navigator. All files start with "be" for Belgium. This is to keep it short, as some systems do only accept 8 characters for the file names. "be" will distinguish them from, for example, "fr" for France. Let's start with the most simple systems: Tomtom and Route66. Also download the BMP22 file above. Unzip both files. Sync your device with your computer. 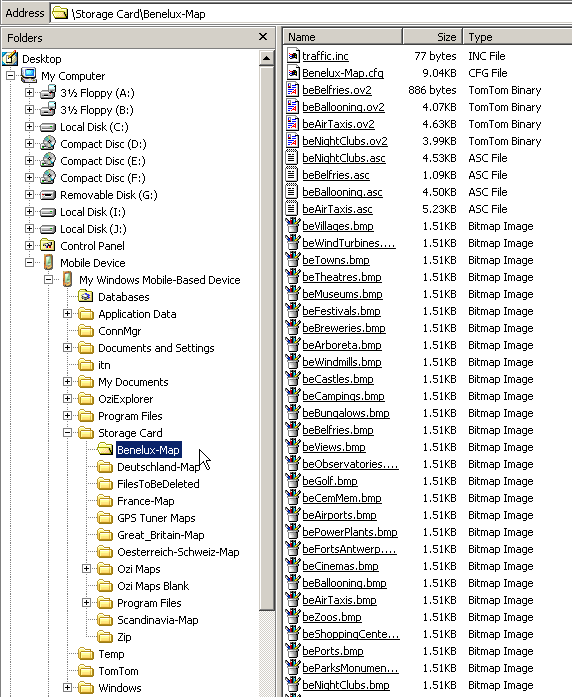 Copy all .ov2 files and all .bmp files (you can copy them all at once) and simply paste them in the same directory on your device as where the Tomtom maps for Belgium are stored, probably "Benelux-Map". This is as simple as Tomtom. Also download the bmp22categories1to20.zip file above. Unzip both files. Sync your device with your computer. Copy all .csv files and all .bmp files (you can copy them all at once) and simply paste them in the same directory on your device as where the Route66 POIs for Belgium are stored, probably "Benelux". In Route66 you choose "Navigate to", then "POIs near GPS position" or "POIs near Destination". Suppose that you want POIs near GPS position and choose "beAbbeys". The list with Abbeys will be presented in order of the distance to your actual GPS position, so if you planned right, your next point to travel to will be number one in the list. No long scrolling. We specify the model, because this is an older one and we use the older NavmanST Desktop Console to load the POI files to the GPS Navigator. We have no experience with the new NavDesk Software. Download and unzip the bmp22categories1to20.zip file above. Download the right Zip file: navman-route66-1to20.zip and unzip it to the .csv files. In SmartST click "Map", then "POIs...". Another window opens. This is the POI Editor. "File", "Open", choose directory, where you stored the unzipped .csv files. Choose one .csv file. "File", "Save to Device". New Window "POI Options" opens. Choose corresponding Icon File (BMP 22x22 pixels with the same name as the .csv file. Click "OK". You will have to do this 20 times. SmartST only takes the first 8 characters of a file and makes all 8 characters Capitals. We suppose that the new NavDesk does not have these limitations. Judy van Vroonhoven from the Netherlands wrote us that she has successfully loaded the Navman POIs via Navdesk to the Navman S70. Everything works great. Download the right Zip file: sygic1to20.zip and unzip it to the .upi files. Download and unzip the bmp27categories1to20.zip file above. Download the right Zip file: garmin1to20.zip and unzip it to the .csv files. Use Garmin PoiLoader to transfer the files and Icons to your Garmin device. Download the right Zip file: miomap1to20.zip and unzip it to the .csv files. 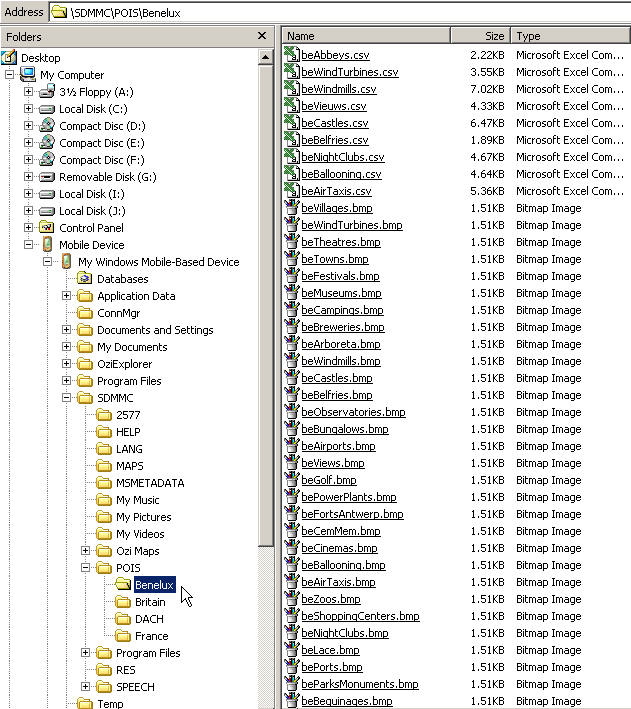 Use MioMap Console to load the files and Icons to your device. Download the right Zip file: mio-igo1to20.zip and unzip it to the .upd files. This is a rather universal format. If none of the above formats works for your GPS Navigator, you should try the GPS eXchange format. Download the right Zip file: gpsexchange1to20.zip and unzip it to the .gpx files. If you managed to install the POI files on a GPS Navigator, not mentioned above, please tell us in detail how you did it. If you agree, we will publish your experience and your name here. Return to the "All POIs Together" page. © belgium-mapped-out.com. All Rights Reserved.